Will these make it into the iPhone 6 and Galaxy S5? Qualcomm has offered us a look behind the curtain at some of the new features which could be arriving in the next batch of smartphones. Speaking at Qualcomm's annual Uplinq conference in San Diego Raj Talluri, SVP Product Management, revealed what the firm was working towards as it readies it processors for the next generation of smartphones and tablets. Here are seven features Qualcomm is tipping, so keep an eye out for all these in the iPhone 6, Samsung Galaxy S5 and iPad 5. Questions are still being raised over the need for 4K displays on smartphones and whether the human eye will actually be able to discern much of a difference between that and the full HD offerings we currently have. Qualcomm reckons we're not actually that far off the UltraHD displays though and Talluri said: "there will be 4K displays in phones pretty soon. I think it's going to happen." Actually 4K video recording has already found its way into the Acer Liquid S2, but the high-def shooting capability is set to feature in a lot more high-end handsets over the next few months. Qualcomm already has a 4K video encoder built into its new Snapdragon 800 processor, allowing manufacturers to build the technology into their handsets if they fancy it. Of course until you have a 4K display on your smartphone, you're stuck hooking it up to your incredibly expensive 4K TV to show off your handy work. A cool feature Qualcomm showed off during its future phone tech presentation was something it's calling SnapDragon EyeSee 360, which basically lets you take a 360 degree video recording. It uses an external device, which works in a similar way to the 360 panorama camera lenses you can get, to capture the video in Ultra HD of your entire surrounds - front and back, left and right - all at the same time. During playback you obviously only see one angle on screen, but you can tilt the device you're playing it on, or use your finger to scroll round the video - as you would a 360 photo - to view the scene all around. The new processor technology means that it's constantly rendering the various different angles and there was no lag during the demo. This means instead of having to move your device around to point at everyone separately, all the people in the video are being recorded continuously and you can then visit any one of the at any time when you're watching it back. Qualcomm is doing a lot of work around camera technology for the next-gen smartphones and one of its projects, UbiFocus, brings depth of field control to phone users. UbiFocus allows you to select your focus after you've taken a picture, giving you the choice of focussing on an object in the foreground, something in the background, or somewhere inbetween. 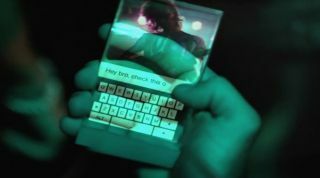 The ability of smartphones to have depth perception could also lead to other advancements and Talluri hinted that the technology may prove very useful when it comes to gesture control in the future. While 4K video recording is all well and good, it would be spoilt by the sound quality you currently get when recording on today's crop of smartphones. Now HTC has already made some progress in this field with the One, which features dual microphones for improved audio capture, but Qualcomm reckons the next generation of mobile phone will have more. Future smartphones could well arrive with four microphones embedded in them allowing for an immersive audio experience which will playback in 5.1 surround sound. The demo clips we were played did indeed sound fantastic, so we're really hoping this arrives soon. It's not just recorded audio which will be getting a boost in future phones, with gameplay set to benefit too with surround sound capabilities being made available to app developers. This allows develops to attach audio to various options, giving the sounds a position in the game and as the objects move the audio does too. We were shown a demo of Qualcomm's Dragon Storm to show off the technology, and as dragons approached us, flew past and continued behind the audio followed. Of course phone manufacturers will have to help us out here as well by equipping our devices with better internal speakers, but it will also work via headphones and external speakers. This one is no surprise, smartphones are going to continue to get faster and more powerful while chip makers and handset manufacturers tackle the battery life issues. Qualcomm expects power consumption to greatly improve, as all the tasks on our smartphones are tuned to use the optimum number of cores and the correct amount of power from each core at the right time. Talluri described this as the "next big challenge" in mobile, and we hope it comes to fruition.